The ultranationalist Right Sector political party has once again rejected the Minsk ceasefire agreement, calling on President Petro Poroshenko to renew the military offensive in the eastern part of the country. “We demand that the Poroshenko regime reject the Minsk agreements, and renew the offensive military operations aimed at liberating occupied territories [in eastern Ukraine],” the statement published on the party’s website reads. The Right Sector movement which was formed as a coalition of nationalist and neo-Nazi paramilitary organizations during the Maidan protests in Kiev at the end of 2013, decided to become a political party in March 2014. At the same time, it nominated its ultranationalist leader and a member of the Ukrainian parliament (Verkhovnaya Rada) Dmitry Yarosh for the presidency. He stated that the Minsk deal is contrary to Ukraine’s constitution, so Ukrainian citizens are not obliged to abide by it. Thus if the army receives orders to cease military activity and withdraw heavy weaponry from the eastern regions, the Right Sector paramilitaries, who are also fighting there, “reserve the right” to continue the war, he said. 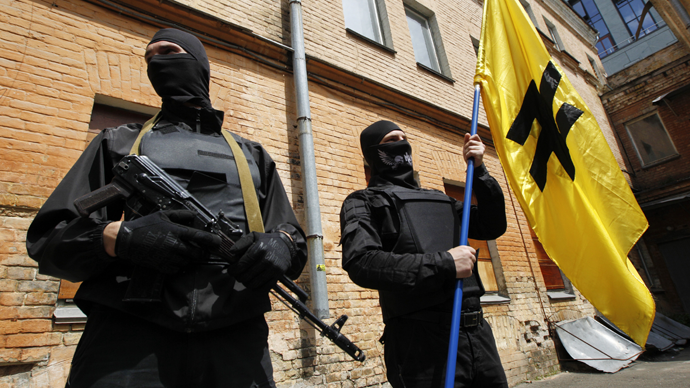 The Right Sector has refused to acknowledge the authority of the current coup-imposed Kiev government. In September 2014, Yarosh threatened Poroshenko, saying he could oust him “like Yanukovich.” Meanwhile, in January presidential aide Yury Biryukov told national TV that Right Sector paramilitary units had refused to come under the command of Ukraine’s Defense Ministry. In Russia the group’s activities were banned under a Supreme Court’s decision in January. In addition, Russia’s Investigative Committee started criminal cases against several members of the radical Ukrainian groups over charges of fighting against the Russian military in the Chechen wars of the 1990s. In March 2014, Yarosh appealed to Doku Umarov, Moscow's most wanted terrorist before he was reported dead, asking him “to take a chance and win over Russia.” He also later threatened to destroy Russian pipelines on Ukrainian territory calling Moscow “an enemy.” Yarosh faces a criminal case over public calls for extremist activities, while Moscow has charged him in absentia, demanding his arrest. In July 2014, Interpol put Yarosh on its wanted list.